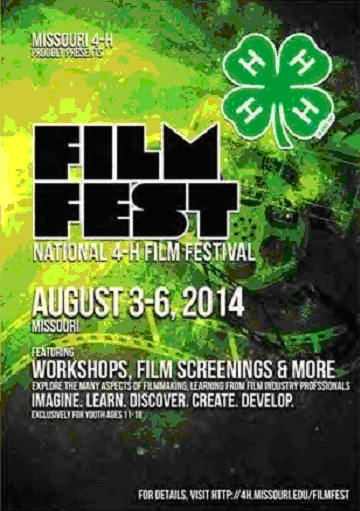 2014 FilmFest 4-H, August 3-6 in St. Louis features a professional director who started making movies at age 12; she’ll share film-making from a youth perspective. A six-time Emmy-nominated make-up artist of Star Trek fame will share his creative artistry. Don’t miss the July 1 deadline if you’re entering a video/film. “Voices of 4-H History” shares updates from Washington, DC and Virginia. The program to record and preserve family and community memories continues to expand across the country. The 4-H History Website, already a wealth of valuable information on the program’s first 100 years, expands even further with a new section on “4-H Brands” for youth-raised farm products. Our National 4-H Calendar Art Restoration program has completed phase one – the repair of 25 original paintings from the National 4-H Council’s collection; now phase two kicks in, to preserve the artwork under protective Plexiglas. Last month we introduced Helen Bovbjerg and Wilbur Jensen, two 4-H’ers who dazzled National 4-H Congress delegates in the 1950s with their exceptional musical talents. This month, we bring you highlights of Wilbur’s musical story from 4-H in a small Oregon town to trumpet performances with Louis Armstrong and other greats. We recognize those people who have shared their treasured memories and memorabilia, and offer them our most sincere appreciation. If you have something to donate; please e-mail the team at: info@4-HHistoryPreservation.com. Ready for summer? Enjoy this issue. This entry was posted in 4-H History Preservation Newsletter, FilmFest and tagged 4-H History, 4-H History Newsletter, FilmFest by NewsAdmin. Bookmark the permalink.